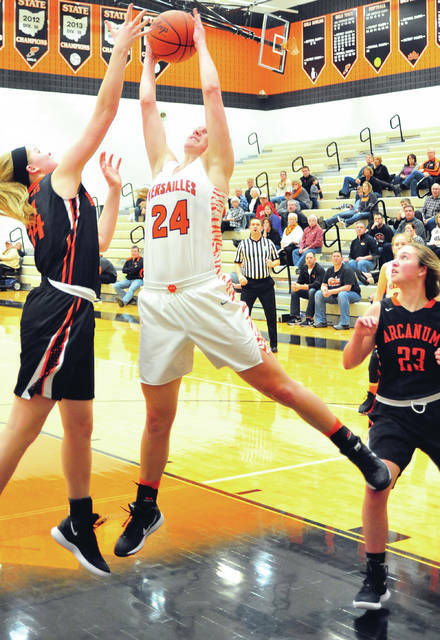 Versailles’ Liz Ording pulls down a rebound against Arcanum’s Taylor Gray as Gracie Garno looks on Tuesday night. Versailles’ Lindsey Winner scores two points against Arcanum Tuesday night. Versailles’ Liz Watren drives past Arcanum’s Camille Pohl Tuesday night. Versailles’ Caitlin McEldowney shoots over Arcanum’s Gracie Garno Tuesday night. VERSAILLES —- Jacki Stonebraker’s message to her Versailles girls basketball team at halftime was clear —- and well received Tuesday night against Arcanum. After a first half full of missed shots and turnovers by both teams, Versailles was holding a 17-12 lead. 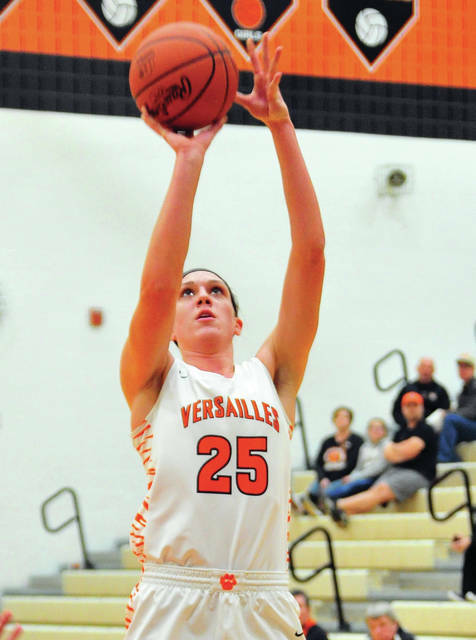 It took just a 1:40 of play in the second half for Versailles to make it 25-12 on its way to a 48-33 victory. Liz Ording started the scoring, Caitlin McEldowney added a steal and layup and Lindsey Winner and Kelsey Custenborder added baskets in the run. 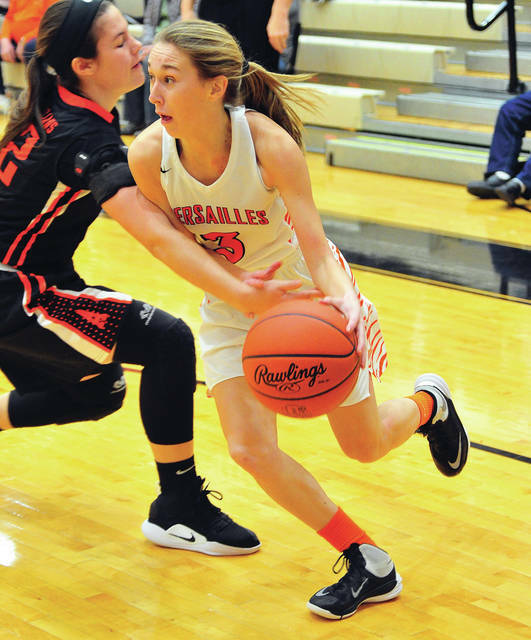 Arcanum’s Hailey Unger answered with a three, but Winner quickly added a field goal and a free throw to Versailles total as the Lady Tigers maintained a double-digit margin for most of the second half. Versailles led 32-22 after three quarters and got off to a fast start in the fourth quarter to put the game away. One of the reasons for that was the play of 6-foot-3 junior Brooke Stonebraker, who had seven points and four rebounds, all in the second half. The game had started with Arcanum taking a 4-0 lead on baskets by Kayla O’Daniel and Taylor Gray. But, Custenborder hit a three and Ording scored six points as Versailles finished the quarter on an 11-2 run. And while the Tigers could find the mark on just one of 11 field goal attempts in the second quarter, they were able to finish the half in front 17-12, with Custenborder and Ording accounting for 15 of the 17 points. Ording was a problem for the Trojans inside all game, finishing with 10 points and 10 rebounds for a double-double. Custenborder also scored 10 points, while Winner had nine points and 11 rebounds. Unger led the Trojans with 15 points, while Gray had eight points and seven rebounds and O’Daniel scored six points. Versailles was 17 of 47 from the floor for 36 percent and 13 of 19 from the line for 68 percent. Arcanum was 14 of 50 from the floor for 28 percent and three of 10 from the line for 30 percent. Versailles won the battle of the boards 45-21, but the Tigers had 29 turnovers. But, many of those came late in the game. 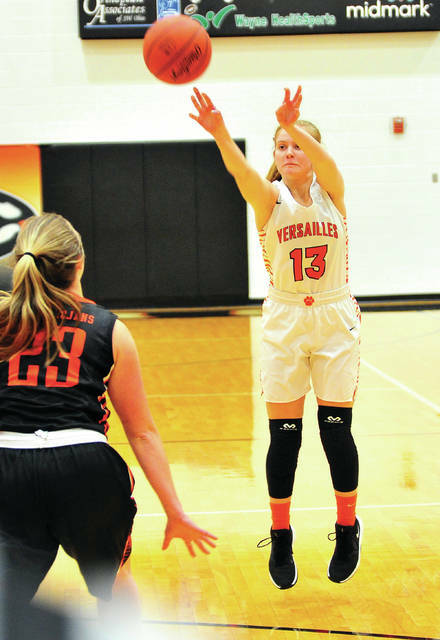 The young Trojans, who start three freshman and have all five starters returning next year, dropped to 14-7 while Versailles improved to 15-5. Versailles will close the regular season by playing at Coldwater Thursday and traveling to Jackson Center Saturday —- after getting the message at halftime Tuesday night. Hailey Unger 5-3-15, Kayla O’Daniel 3-0-6, Grace Garno 0-0-0, Madelyn Fearon 2-0-4, Taylor Gray 4-0-8, Camille Pohl 0-0-0, Eva Siculan 0-0-0. Totals: 14-3-33. Caitlin McEldowney 2-0-4, Hannah Barga 0-2-2, Liz Ording 4-2-10, Lindsey Winner 4-1-9, Kelsey Custenborder 3-3-10, Liz Watren 2-0-4, Savannah Toner 0-2-2, Caitlyn Luthman 0-0-0, Brooke Stonebraker 2-3-7, Kate Griesdorn 0-0-0, Rachel Lyons 0-0-0. Totals: 17-13-48. 3-point field goals —- Arcanum: Unger (2). Versailles: Custenborder. Records: Arcanum 14-7, Versailles 15-5. Reserve score: Versailles 54, Arcanum 50.